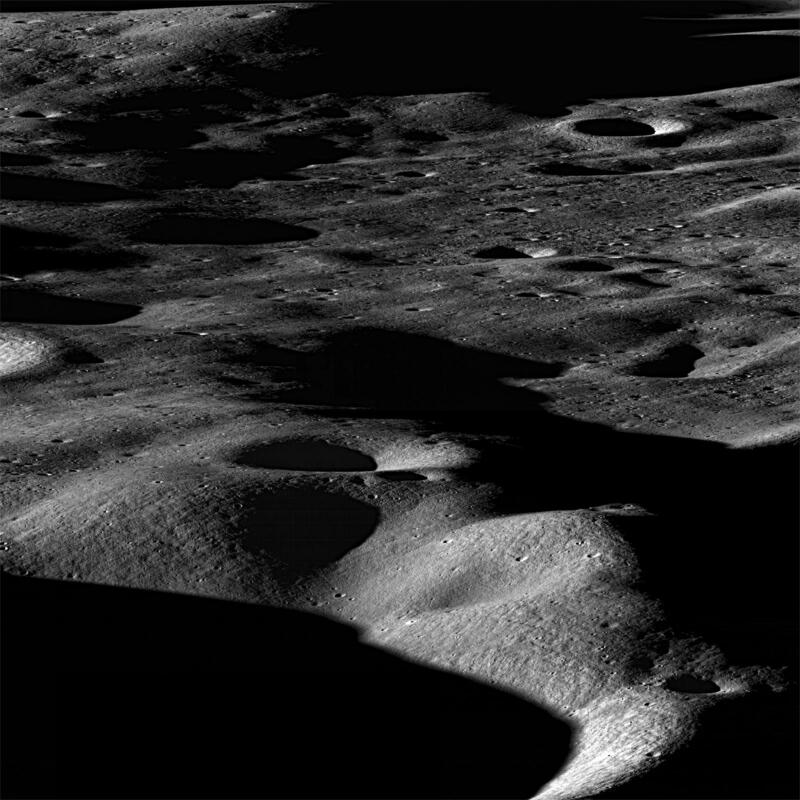 Electrically charged lunar dust near shadowed craters can get lofted above the surface and jump over the shadowed region, bouncing back and forth between sunlit areas on opposite sides, according to new calculations by NASA scientists. The research is being led by Michael Collier at NASA’s Goddard Space Flight Center, Greenbelt, Md., as part of the Dynamic Response of the Environment At the Moon (DREAM) team in partnership with the NASA Lunar Science Institute (NLSI), managed at NASA’s Ames Research Center, Moffett Field, Calif.
“The motion of an individual dust particle is like a pendulum or a swing,” says Collier. “We predict dust can swarm like bees around a hive over partially shaded regions on the moon and other airless objects in the solar system, such as asteroids. We found that this is a new class of dust motion. It does not escape to space or bounce long distances as predicted by others, but instead stays locally trapped, executing oscillations over a shaded region of 1 to 10 meters (yards) in size. These other trajectories are possible, but we now show a third new motion that is possible.” Collier is lead author of a paper on this research published October 2012 in Advances in Space Research. 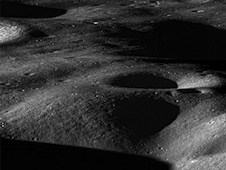 This effect should be especially prominent during dusk and dawn, according to the team, as regions become partially illuminated while features like mountains and crater rims cast long shadows. There is evidence that dust actually moves this way over the lunar surface. “There are hints for this type of dust swarm in Surveyor images. A twilight was observed over the landed platforms during dusk and dawn. This was surprising at first because the moon does not have a dense enough atmosphere to scatter light when the sun is below the horizon. It was long considered to be light scattered from lifted dust. This model suggests the dust is really leaping or swarming overtop a large number of shaded regions that would exist along the lunar dusk/dawn line, called the lunar terminator. It’s a natural fit. Charged lunar dust transport is also believed responsible for the Apollo 17 Lunar Ejecta and Meteorites (LEAM) experiment’s observation of highly charged dust near the terminator,” adds Collier. To our eyes, the moon has no apparent activity and seems dead. However, because it has almost no atmosphere, the moon is exposed to the solar wind, a thin stream of electrically conducting gas called plasma blown off the surface of the sun at around a million miles per hour. The effects of sunlight and the solar wind generate a bustle of unseen commotion at the moon. On the day-lit side, sunlight knocks negatively charged electrons off the surface, giving it a positive charge. On the night side or in shadow, electrons from the solar wind rush in, giving the surface a negative charge. The exact mechanism for launching lunar dust is not uniquely known. Micro-meteoroid impacts can transfer energy to the surface to launch particulates. Also, a rough surface has small, localized concentrations of electric fields that could lift dust electrostatically from the surface. The pendulum motion then happens because sunlit areas on the moon tend to get positively charged, while shaded areas become negatively charged. Since like charges repel each other, a positively charged dust grain in a sunlit area gets pushed away from the positively charged surface. If there were no negatively charged area nearby, the dust grain would rise straight up. However, since opposite charges attract, the positively charged dust gets pulled toward the negatively charged crater floor, bending its path over the crater. Dust launched from the sunlit area with just the right speed will pass over the shaded floor of the crater to the sunlit area on the other side, where the positively charged surface there will reflect it back over the crater again. When many particles do this, the model predicts there should be a swarm or canopy of dust over the crater. If there were no complications, the particle could continue to bounce between sunlit areas on opposite sides of the crater indefinitely. However, in reality, things like differences in crater rim height, roughness on the crater floor, and interference from the solar wind that weakens the electric field produced by the surface charges can alter the particle’s path. 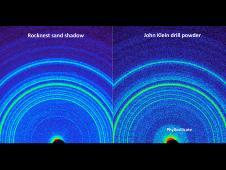 These perturbations cause the dust to eventually either fall into the crater or be launched away. “This model provides a natural explanation for the observation of dust ponds inside craters on the asteroid Eros,” says Collier. “Calculating how these complications will affect the path of a dust particle on the moon and around asteroids are good areas for future research,” says Collier. “Additionally, we’re not sure how many particles get charged and move like this – is it something like one in a thousand, one in a million, or one in a billion? We’d like to do more studies to see how likely it is that a particle will behave this way. Since most of the lunar surface is covered in dust, even one in a billion would still be significant.” The team is also planning on examining Apollo-era images to evaluate possible evidence for dust canopies over shadowed craters. The team includes Collier, Farrell, and Timothy Stubbs, also at NASA Goddard. The research was funded by the NLSI. NLSI is a virtual organization funded by NASA’s Science Mission Directorate and the Human Exploration Office in Washington, which enables collaborative, interdisciplinary research in support of NASA lunar science programs. The institute uses technology to bring scientists together from around the world and is comprised of competitively selected U.S. teams and several international partners. Experimental set-up of the quantum teleportation device including an entangled light-emitting diode (ELED) and an assortment of beam splitters polarization controllers, detectors, and photodiodes. The researchers demonstrated that the device can generate single pairs of entangled photons with advantages compared with using a laser due to the electrical control provided by the ELED. Credit: J. Nilsson, et al. ©2013 Macmillan Publishers Limited. All rights reserved. (Phys.org) —In a new study, physicists have teleported photonic qubits made of pairs of entangled photons that are generated by an LED containing an embedded quantum dot. The novel set-up has advantages compared to the conventional method of generating entangled photons using a laser, and could lead to a simplified technique for implementing quantum teleportation in quantum information applications. The researchers, J. Nilsson, et al., at Toshiba Research Europe Limited and the University of Cambridge, both in Cambridge, UK, have published their paper on demonstrating quantum teleportation using an LED in a recent issue of Nature Photonics. As the scientists explain, quantum teleportation—a process in which quantum information is destroyed so that it may be transferred simultaneously to another location—has been proposed as a way to create quantum communication networks and quantum computing protocols despite the no-cloning theorem. According to the no-cloning theorem, quantum information cannot be copied. Although no-cloning enables quantum cryptography to have a high degree of security, it also limits the options to create quantum communication networks and increases the losses in quantum computing due to imperfect measurements. Teleporting the information may offer a solution for these two areas. In quantum communication networks, teleportation can establish a quantum channel between two nodes. In quantum computing, teleportation can transfer qubits from successful logic operations, while the other qubits can be thrown out. Although quantum teleportation can be implemented with different systems, the researchers here argue that photonic qubits are best suited for the largest number of applications. One of the most important parts of the photonic teleportation process is having a light source that produces single pairs of entangled photons. Although lasers can be used to generate the photons, they involve practical complexities and sometimes generate multiple photon pairs, and these problems have inhibited their use in quantum information technologies. Read more: Quantum teleportation performed with light from a quantum dot embedded in an LED — phys.org. ESA and the Russian federal space agency, Roscosmos, have signed a formal agreement to work in partnership on the ExoMars programme towards the launch of two missions in 2016 and 2018. Establishing whether life ever existed on Mars is one of the outstanding scientific questions of our time and the highest scientific priority of the ExoMars programme. The partners have agreed a balanced sharing of responsibilities for the different mission elements. ESA will provide the Trace Gas Orbiter (TGO) and the Entry, Descent and Landing Demonstrator Module (EDM) in 2016, and the carrier and rover in 2018. Roscosmos will be responsible for the 2018 descent module and surface platform, and will provide launchers for both missions. Both partners will supply scientific instruments and will cooperate closely in the scientific exploitation of the missions. ExoMars will also demonstrate core technologies under development by European industry such as landing, roving, drilling and sample preparation that are an essential part of paving the way for the next big step in the robotic exploration of Mars: a sample-return mission. The 2016 mission has two major ESA elements: TGO and EDM. TGO will search for evidence of methane and other atmospheric gases that could be signatures of active biological or geological processes. It will also serve as a data relay for the 2018 mission. EDM will land on Mars to prove key technologies for the 2018 mission. In 2018, the ExoMars rover, to be provided by ESA, will search the planet’s surface for signs of life, past and present. It will be the first Mars rover able to drill to depths of 2 m, collecting samples that have been shielded from the harsh conditions of the surface, where radiation and oxidants can destroy organic materials. The rover will be delivered by a Russian descent module that includes a surface platform equipped with additional scientific instruments. Today, ESA Director General Jean-Jacques Dordain and Head of Roscosmos Vladimir Popovkin met at ESA Headquarters in Paris to sign an agreement that seals ExoMars as a partnership between the two space agencies. 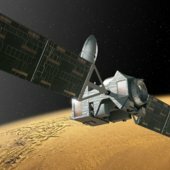 “This is a momentous occasion for the ExoMars programme that will see industry and scientists from Europe and Russia working together on these two exciting missions, which will develop new technologies that will demonstrate the competitiveness of European industry, be important for preparing a solid participation of ESA in future international exploration missions and address the key question of whether life ever arose on Mars,” says Jean-Jacques Dordain. “It has been a long way, we have performed a large amount of work together. The ExoMars programme is to become the second large project after Soyuz in Kourou,” says Vladimir Popovkin. NASA will also deliver important contributions to ExoMars, including the Electra UHF radio package for TGO, and Mars Proximity Link telecom and engineering support to EDM. Today’s signature between ESA and Roscosmos provides the basis for industry and scientific institutes to begin full cooperation on the missions and to meet the challenging schedule, with the first launch planned in January 2016. The ExoMars Programme is funded by 14 ESA states (Austria, Belgium, Denmark, France, Germany, Italy, the Netherlands, Norway, Portugal, Spain, Sweden, Switzerland, and the UK and Canada) of which Italy is the largest contributor and the UK the second largest. 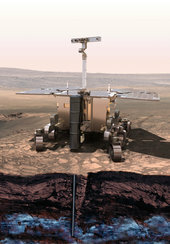 Member states also provide scientific instruments to ExoMars. For the 2016 TGO, these include the infrared and ultraviolet spectrometer package NOMAD (led by Belgium) and the CaSSIS high-resolution colour stereo camera (led by Switzerland). Italy will lead the DREAMS environmental station on EDM. The 2018 Rover will comprise PanCam, a wide-angle and high-resolution camera system (led by the UK); CLUPI, a close-up imager (led by Switzerland); WISDOM, a ground-penetrating radar (led by France); Ma_MISS, a miniaturised infrared spectrometer integrated in the subsurface drill (led by Italy); MicrOmega, a visible and infrared imaging spectrometer (led by France); RLS, a Raman spectrometer (led by Spain), and MOMA, a novel organic molecule detector (led by Germany, with substantial contributions from the United States). PASADENA, Calif. — An analysis of a rock sample collected by NASA’s Curiosity rover shows ancient Mars could have supported living microbes. Scientists identified sulfur, nitrogen, hydrogen, oxygen, phosphorus and carbon — some of the key chemical ingredients for life — in the powder Curiosity drilled out of a sedimentary rock near an ancient stream bed in Gale Crater on the Red Planet last month. Clues to this habitable environment come from data returned by the rover’s Sample Analysis at Mars (SAM) and Chemistry and Mineralogy (CheMin) instruments. The data indicate the Yellowknife Bay area the rover is exploring was the end of an ancient river system or an intermittently wet lake bed that could have provided chemical energy and other favorable conditions for microbes. The rock is made up of a fine-grained mudstone containing clay minerals, sulfate minerals and other chemicals. This ancient wet environment, unlike some others on Mars, was not harshly oxidizing, acidic or extremely salty. Curiosity’s drill collected the sample at a site just a few hundred yards away from where the rover earlier found an ancient streambed in September 2012. “Clay minerals make up at least 20 percent of the composition of this sample,” said David Blake, principal investigator for the CheMin instrument at NASA’s Ames Research Center in Moffett Field, Calif. These clay minerals are a product of the reaction of relatively fresh water with igneous minerals, such as olivine, also present in the sediment. The reaction could have taken place within the sedimentary deposit, during transport of the sediment, or in the source region of the sediment. The presence of calcium sulfate along with the clay suggests the soil is neutral or mildly alkaline. “The range of chemical ingredients we have identified in the sample is impressive, and it suggests pairings such as sulfates and sulfides that indicate a possible chemical energy source for micro-organisms,” said Paul Mahaffy, principal investigator of the SAM suite of instruments at NASA’s Goddard Space Flight Center in Greenbelt, Md. An additional drilled sample will be used to help confirm these results for several of the trace gases analyzed by the SAM instrument. Scientists plan to work with Curiosity in the “Yellowknife Bay” area for many more weeks before beginning a long drive to Gale Crater’s central mound, Mount Sharp. Investigating the stack of layers exposed on Mount Sharp, where clay minerals and sulfate minerals have been identified from orbit, may add information about the duration and diversity of habitable conditions. 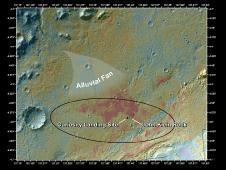 NASA’s Mars Science Laboratory Project has been using Curiosity to investigate whether an area within Mars’ Gale Crater ever has offered an environment favorable for microbial life. Curiosity, carrying 10 science instruments, landed seven months ago to begin its two-year prime mission. NASA’s Jet Propulsion Laboratory in Pasadena, Calif., manages the project for NASA’s Science Mission Directorate in Washington. Transatomic Power is the name of the company and its contribution to the energy sector is a newly designed nuclear reactor that will be half the cost of competing technologies. It’s not a new idea. It was first proposed and tested for six years in the 1960s at Oak Ridge National Laboratory. But for some reason the technology was never fully developed. What type of reactor is it? Fission using molten salt. Transatomic has created a specification for a 500-Megawatt reactor and has raised its first million in seed capital as well as attracted a strong technical team with nuclear pedigree. Read more: New Molten-Salt Reactor Company a Spinoff from MIT | World Future Society.